Bug is in the eighth grade. This means that he’s all knees, and elbows, and awkwardness. This means he often sits down with me and wants to tell me his thoughts on Pokemon, how stars are made, how many days until Christmas, and the state of the government. This means he’s in the space between childhood and adulthood. It also means more days than not, he wants to work without much of my help (or attention). He’ll still smile and ham it up when I bring out my camera for these posts, but he’s very serious and wants to be sure that he’s “getting it right” when the shutter clicks. He wants me to make sure you to know that he’s hardworking and smart, and that every assignment he did while I was evaluating this curriculum was done with his best effort. The middle school years are hard. When Bug was little, I dreaded him growing up. But, there is so much to love about this new stage of his life. He may have moments of insecurity and sass, but it’s a joy to watch him grow into adulthood. 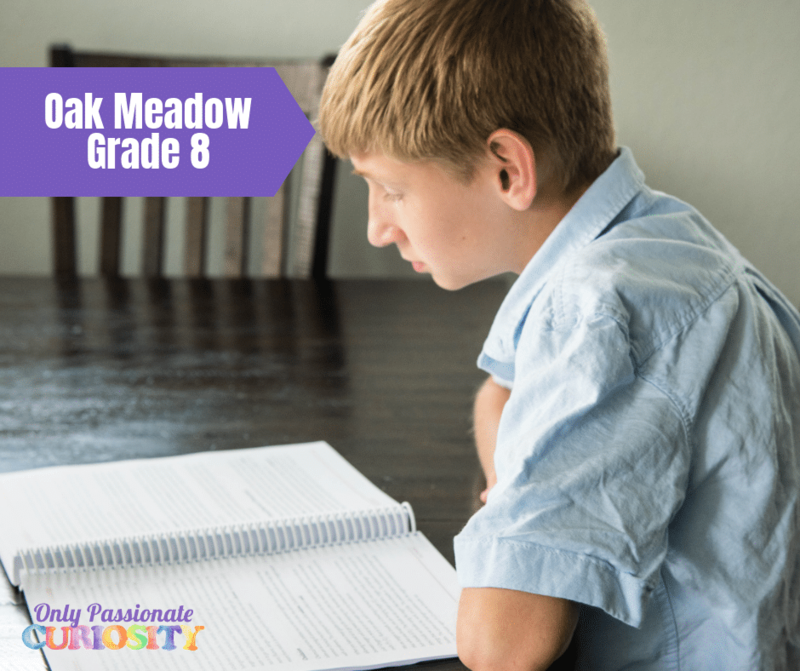 Oak Meadow has continued to be a worthy companion for our family, and once again, the curriculum developers seem to understand exactly what kinds of lessons he needs at this stage of his development. I am so impressed with the thoughtfulness of this curriculum. This book goes so much deeper than just how the government is structured or how it works. This program encourages deep thought on how your child fits into their community, what is right and wrong, why Supreme Court cases were decided in the way that they were, and what the decisions mean, and how they can interact with others in their community to make the world a better place. Our family is very involved in politics, so along with this curriculum Bug is spending a lot of his time this fall getting hands-on practice with this curriculum as he volunteers on a local campaign. It’s been wonderful for him to be able to read his lessons, and then discuss them with the candidate, staffers, and volunteers who are working towards the midterm elections. I am excited for him to end the year with a well-rounded understanding of how the government is supposed to work, and how he can work to make things better. 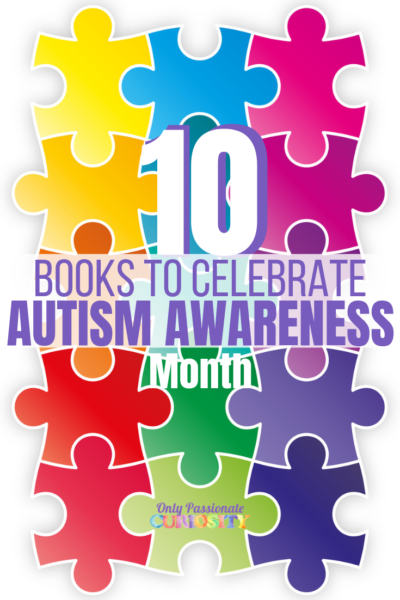 The curriculum includes reading and “many opportunities for students to experience, explain, diagram, model and reflect on the concepts they are learning.” This is a subject that Bug is always excited to do, and often tries to do all in one day because it’s so hard for him to walk away from the lessons one he has started. 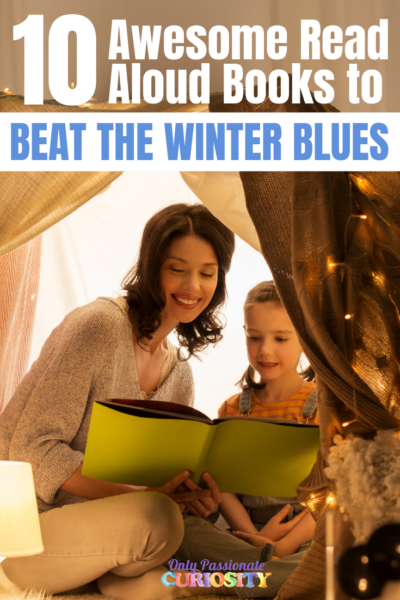 Each lesson starts with reading, includes activities and assignments (hands-on and written) and has a test for your child to share what they have learned. I tend to use these tests as open book assignments, and check Bug’s work by looking at the “learning checklist” included at the end of the chapter. The lab manual (and all the hands-on labs) are Bug’s favorite part of this year’s curriculum. I love how user-friendly the lab manual is. Most of the time, I don’t allow Bug to write in his books, but this is one that I will happily allow him to consume. This is a data-driven program, with plenty of tables to fill out, things to chart, and lab reports to write. I appreciated that this workbook has room for Bug to fill in the pages – in the other subjects, Bug is expected to write on a separate piece of paper and structure his work on his own, but I think having the labs already formatted for him will save us a lot of stress this school year. One more thing to love about the science program – despite the emphasis on labs this year, the curriculum still has its creative side as well. Bug is keeping a visual dictionary of science terms, illustrating concepts as he learns them. The language arts program is probably the part of the curriculum that Bug likes least, only because he isn’t a huge fan of writing. This program covers writing, using the Elements of Style, grammar, vocabulary, and literature. Students are asked to keep a readers journal to reflect on what they are reading and to flesh out their ideas for writing assignments. The addition of the book, 100 Ways to Improve Your Composition and Creative Writing, is wonderful. 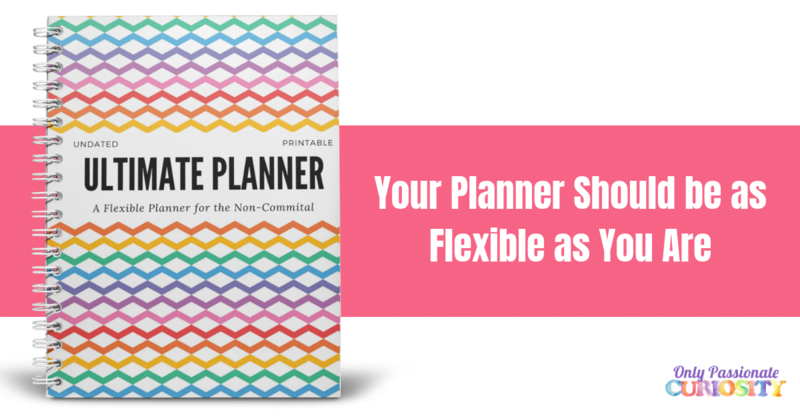 It’s got practical activities to improve his writing, and he does it without complaint. Even if you aren’t using this curriculum, I would recommend picking this writing book up as a supplement for your middle schooler. This year, I am noticing an increase in the number of research-based assignments, and more emphasis on literary elements. Bug has done more writing this year than he has done in the past, and his work is taking him slightly longer because of this. 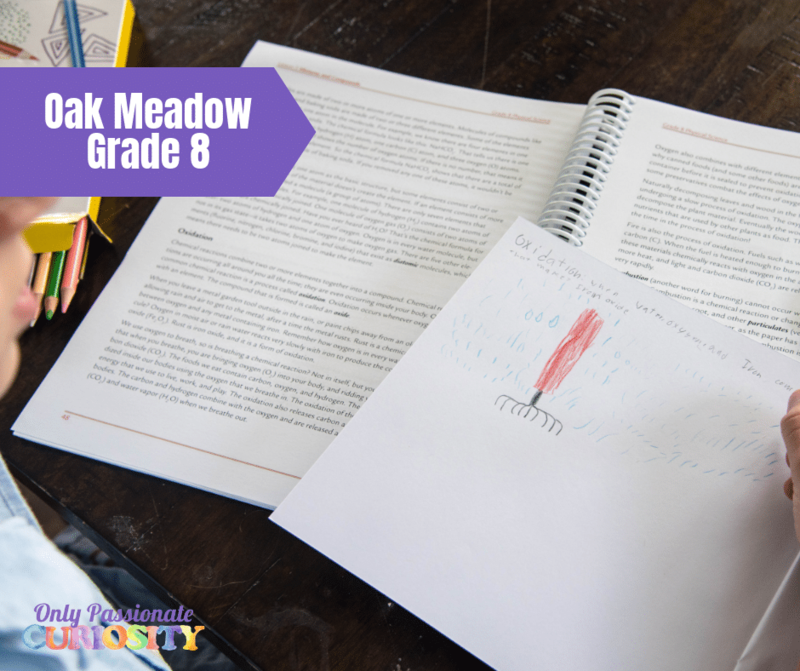 Being a bit of a wild boy, he doesn’t love to sit and write, but again, Oak Meadow is still offering him a variety of choices when it comes to his assignments so he maintains some control over what kinds of work he does. 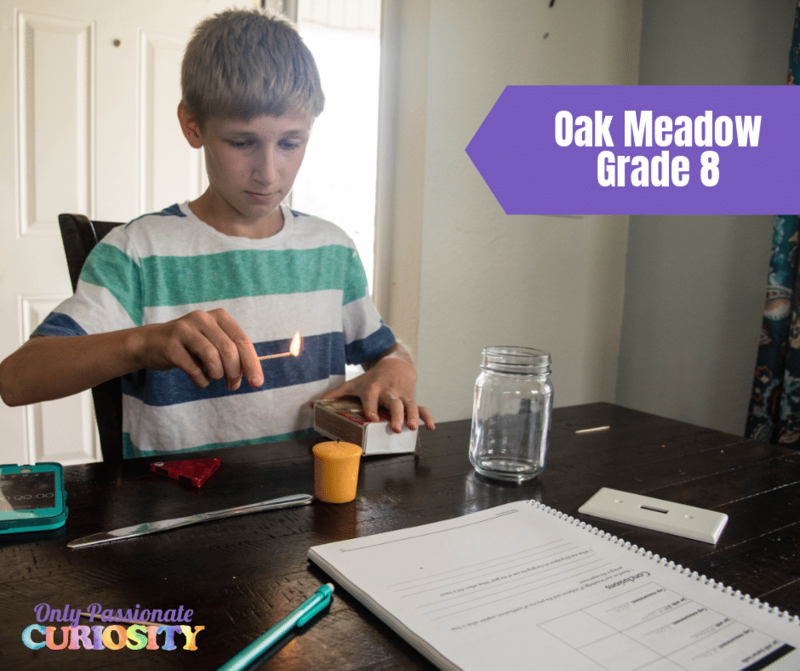 These days, he often chooses research-based tasks instead of creative assignments, which was surprising to me at first, but it’s fun to watch him mature as he works through the curriculum. 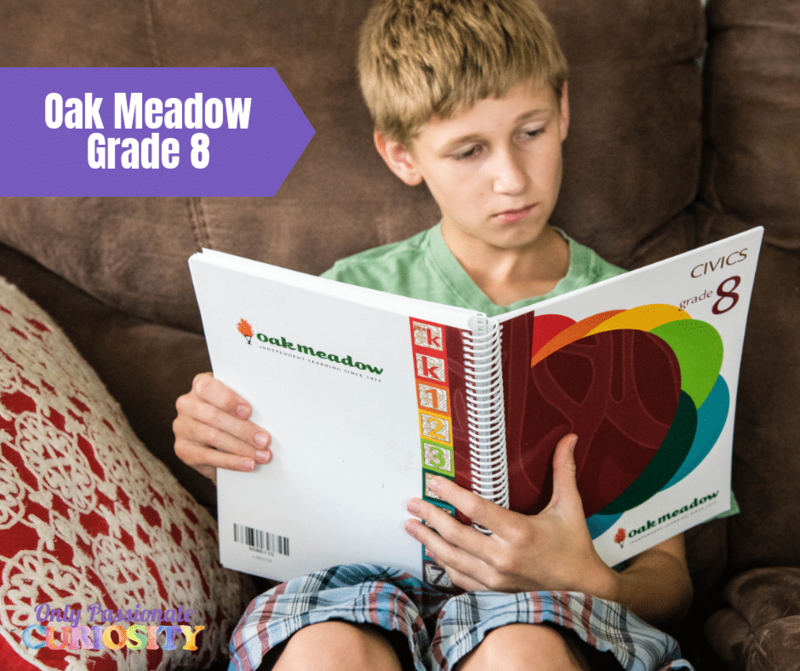 This year, Oak Meadow moved to Teaching Textbooks for their math program. I love this change, because we have been using Teaching Textbooks for years, and now I have that extra validation that a school I trust also chose this program. We have standardized tested Bug each year, and he always tests above grade level using this program. I like it because it’s fully hands-off for me, but he still gets the in-depth instruction that Math really requires. 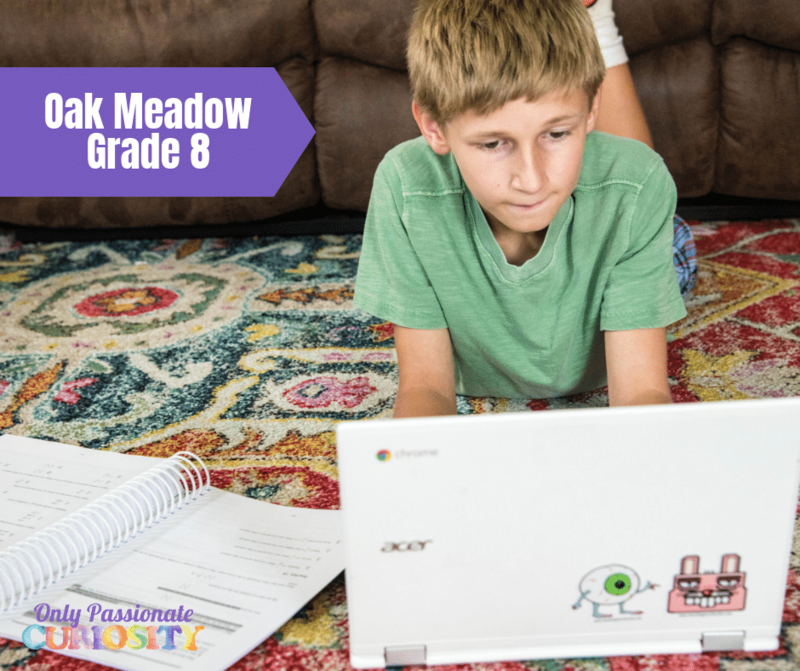 Oak Meadow only uses the written version of the curriculum (not the computer program) which includes all of the same content you get on the disks. I personally choose to pay for the online version in addition to using the book, because Bug does so well with the audio lectures, but how you do this is up to you! I can tell you right now that this level is shaping up to be my favorite year with Oak Meadow yet. We are absolutely in love with the lab manual and the civics program in particular, and I am excited to read some of these (new to me) book titles alongside Bug. 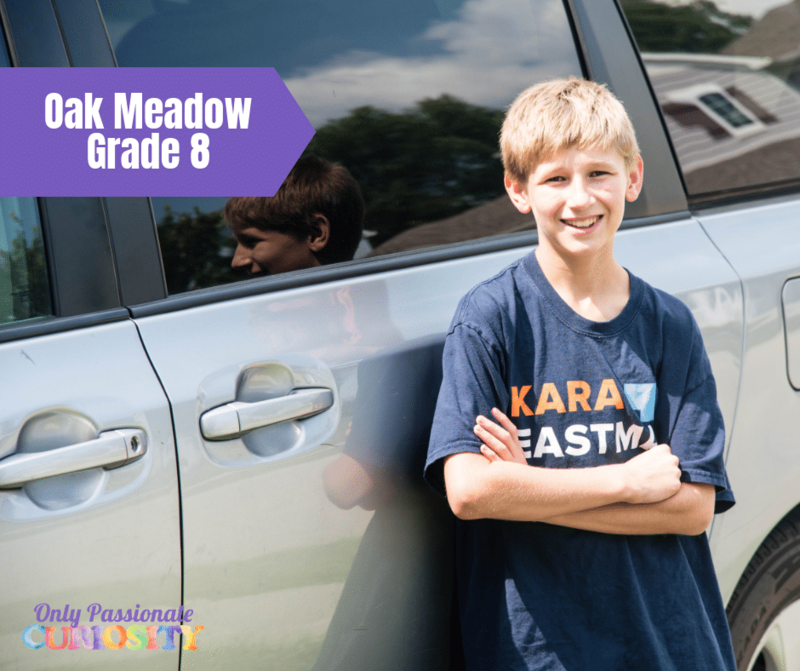 I am pleasantly surprised that in the Eighth Grade he is still maintaining his joyfulness and that the curriculum is still flexible, creative and hands-on. He may be growing up quickly, but he is still a child and I want him to have room to enjoy these final years of boyhood. I am going to forever be grateful to Oak Meadow for giving us the wiggle room to be a family while still prioritizing academics. 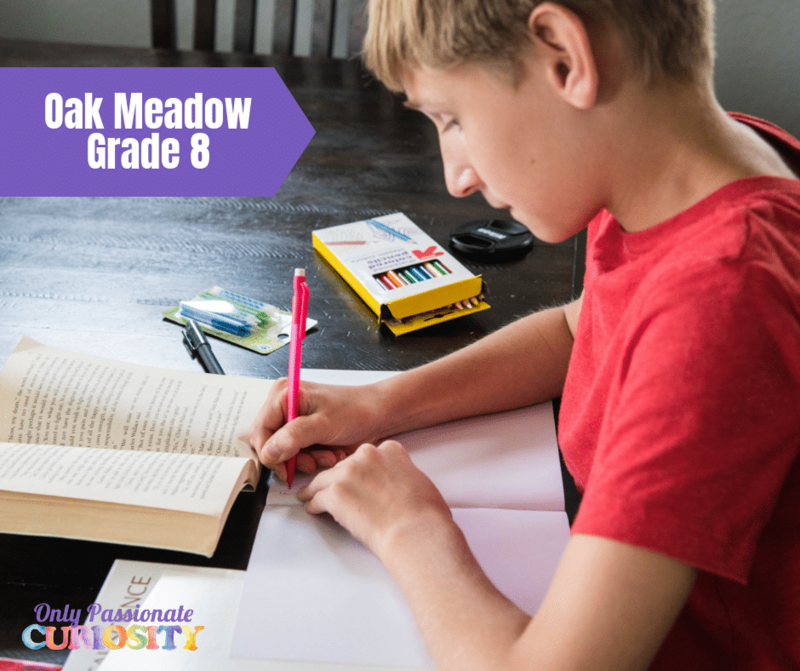 Oak Meadow is graciously offering one OPC reader a full grade level curriculum (choose a level Pre-K through Grade 8) to use with their homeschooled child. Use the giveaway widget below to enter to win. 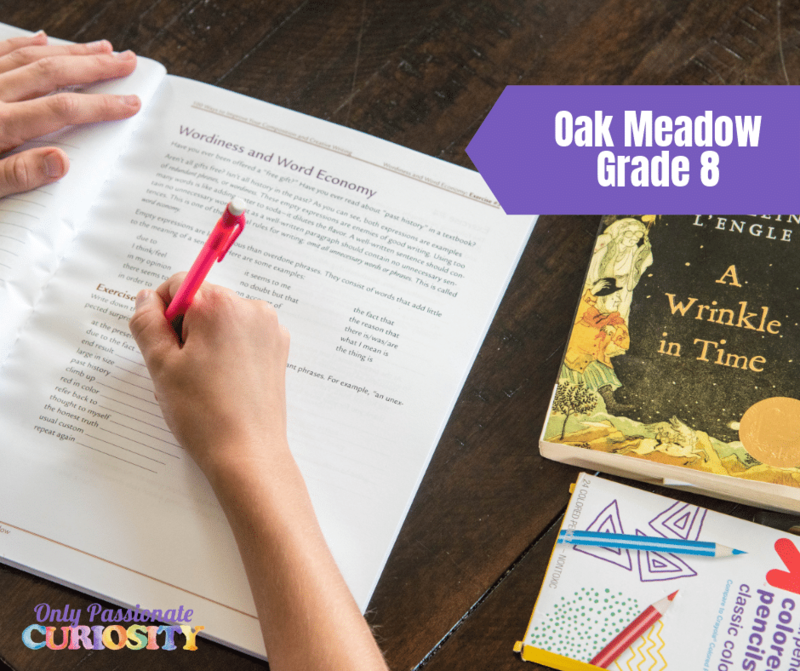 We’ve used Oak Meadow since Preschool and are using the 6th grade curriculum this year. Love it! Winning the 8th grade curriculum would save us time and money. I entered my email, posted to Facebook, Twitter, LinkedIn, and Pinterest, and followed you on Facebook. Thank you for the opportunity! 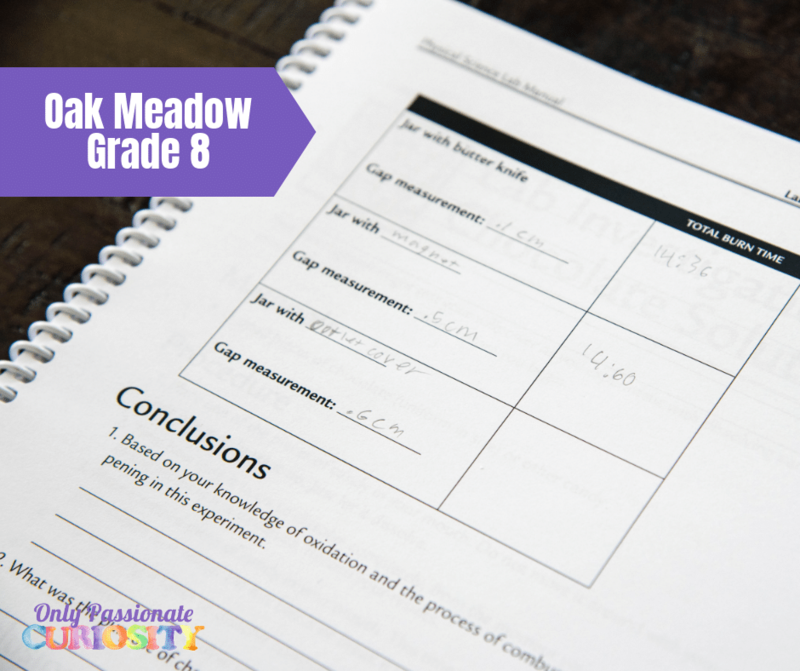 I used Oak Meadow for my granddaughter for third grade. We started my grandson started fourth grade Oak Meadow but we had to stop due to him becoming ill. He has been out of school for 4 years now , with limited schooling. Now he is better and we hope to cover through 8th grade this year. Oak Meadow is our choice. I have been looking at Oak Meadow for a while and it would be a blessing to win a level! This curriculum seems great! We did TT one year and really liked it. 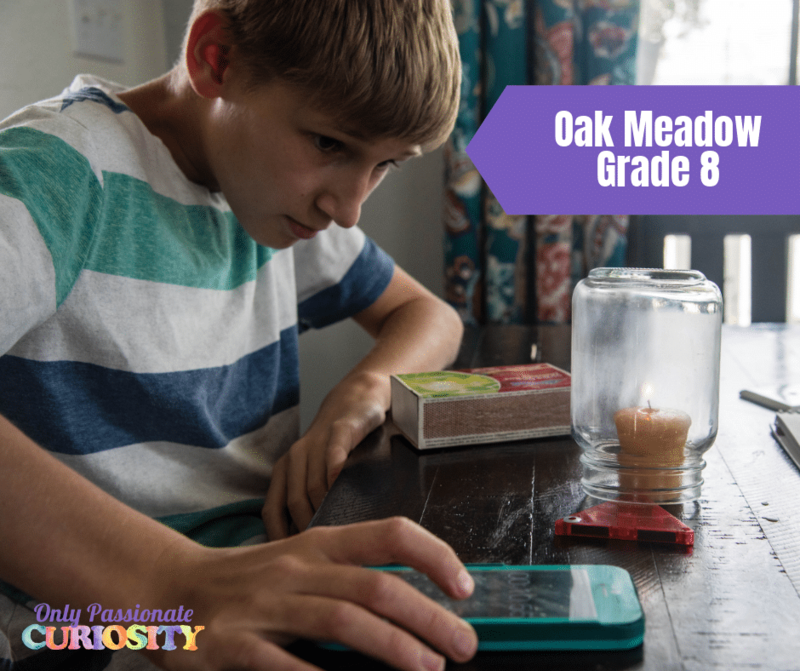 I have actually never heard of Oak Meadow curriculum, but then again, I am still rather new to homeschooling. 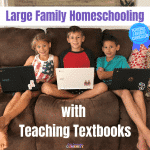 I love all that you have written about this curriculum and think it could be a great new direction for our family. I would love it for my oldest who is in 4th grade. What a great blessing it would be to receive this curriculum. Thank you for the chance to win.